Stay current with Six Element Machining on design trends, machining tips and technologies. 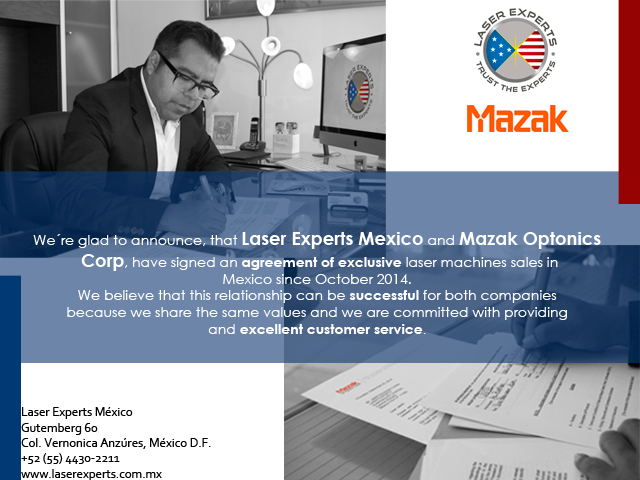 Elgin, Illinois, March 2015 – Mazak Optonics Corporation is pleased to announce an exclusive partnership with Laser Experts Mexico for laser machine sales in Mexico. Laser Experts Mexico was founded in 2011 in Mexico City and quickly established themselves as specialists for the support of laser-cutting machines. They now have additional offices in Chicago, China and Vietnam and offer full maintenance services for laser generators, software and controls. They also offer an extensive range of laser machine parts and sell both new and used laser machines in Mexico and South America. The exclusive partnership will encompass all regions of the Mexico and is effective immediately. Six Elements Machining ensures architects and engineers quality control and cost-efficiency. Six Elements Machining is a division of Brett Machining and has been serving the following local communities, areas and cities for the past 15 years: Concord 95418, 94519, 94520, 94521, 94522, 94523, 94524, 94527, 94529, Walnut Creek 94595, 94596, 94597, 94598, Lafayette 94549, Moraga 94556, Pleant Hill 94523, Danville 94506, 94526, San Ramon 94582, 94583, Dublin 94568, Pleasanton 94568, 94588, Livermore 94550, 94551, Alamo 94507, Diablo 94528, Contra Costa, Alameda, San Francisco, Oakland, San Jose, Fresno, Visalia, Monterey, Salinas, Sacramento, Stockton, Modesto. Brett Machining, DBA Six Elements Machining, is ISO (9001:2008) compliant and can provide CMM certification. We are located at 3241 Monument Way, Unit L, Concord, CA 94518. For more information, please contact us at (925) 609-7998.